Massimo Menotti is a guitarist devoted in recent years in particular to modern and contemporary repertoire, dividing his time between classical and electric guitar, creating original music for installations, videos and sounds environments presented in several festivals and public spaces. 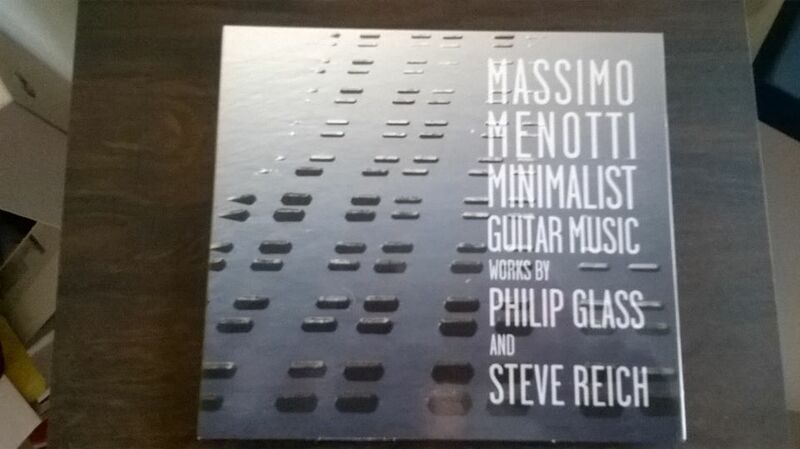 2015 saw him happily engaged in the realization of this great cd “Minimalist Guitar Music” dedicated to the repertoire of the first minimalism, years between 1967 to 1969, by the two “American maverick” Philip Glass and Steve Reich and recorded for the Orange Mountain Music, independent record label run by the same Glass. The three scores we listen to on this CD, are minimalist works not composed for guitar, but rather arrangements for the six strings processed by the same Menotti. It begins with “Music in Similar Motion” by Glass, originally performed by a sextet with three percussion instruments and three organs arranged by Menotti for four guitars, here used as almost strictly percussive and with a sound far away from dynamic and colors that the classic instrument has become accustomed. The second song is “Two Pages” also for organ, and here for solo guitar, a song featured even more of “Music in Similar Motion” by a rigorous and almost ascetic language, with length of almost 23 minutes in shade G minor. Closes the disc the transcription for two guitars of “Piano Phase” (1967) by Steve Reich Music, perhaps the best-known work, where Reich apply for the first time the idea of phasing in a live performance for two pianos. The idea of translating these three pieces for guitar is interesting and not change anything abouth originality and the value of these pieces, which were being designed and carried out for a variety of instruments, lend themselves well to the transposition for six strings, demonstrating rather even more the their potentials were inside the music and their structures. Menotti proves to be a rigorous and original performer and interpreter while maintaining his focus and high intensity on these scores characterized by a considerable length (minimum nearly 18 minutes of “Music in Similar Motion”), being able to generate a kind of guitar trance which almost allows the listener to escape by the rigor and lack of dynamic expected from these kind of minimalist machines. This is not an easy listening record but that sheds new light in the repertoire minimalist, very good audio recording quality.